i thought i’d make a batch of brownies because i caught sight of a tub of vanilla ice cream in the freezer. these little pieces of heaven actually lived up to their name. i think this is the closest you could get to utter dampness and fudginess without being wet or soggy or undercooked. it’s sticky rich and perfect with ice cream. the interesting thing about this recipe is that it calls for brown sugar instead of the normal caster sugar. that lends a sort of unique taste to the brownie, which might be acquired, but i loved it. 1. preheat oven to 150 degrees celsius. line a 9 inch square shallow tin with foil and grease with butter or oil. 2. in a large saucepan, melt the butter. when half melted, add the chocolate. remove from heat when the chocolate is nearly melted and stir until mixture is smooth. 3. stir in sugar, salt, vanilla essence and eggs. mix until combined. 4. stir in flour until well combined. stir in chocolate chips/dark chocolate pieces. pour batter in tin. bake for around 25-28 minutes, until top is dry but centre is still damp. remove from oven, cool completely. refrigerate and cut into squares. Aww that is just too sweet! Could i ask where you got the cute little trays from? And those look truly deadly…can’t wait to try it out. chitz: hahaha not ever la. i’m sure there’s more people sweeter than me. :p do try it out. i had a warm one with ice cream yesterday. it was orgasmic. hehe. ahhhhh it looks so so good!! and you sweet missus, you! 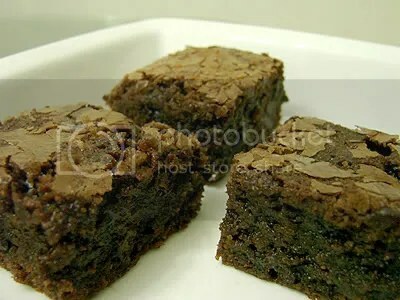 Wow my hubby will love these, he loves fudgy type brownies and I am always looking for a new recipe to try, this will be one! faizah & laurie: 😀 try it! it’s foolproof. These look deadly…they would not last a day under my supervision! Great recipe! oh, looks so good!!! can i ask what are those blue decorations made of? argh nampak sedap tapi tak dapat makan! nadia: tgh hint la tu. ajak kluar la! hahaha. hi mariya! tt time i asked to make the cupcakes with the vball theme.It was very nicely done! and my favourite love it! but kinda of abit too swt! but still job WELL DONE! thanks lots! hello teckhua, thanks for the feedback! anyway just asking, which part of it was sweet? 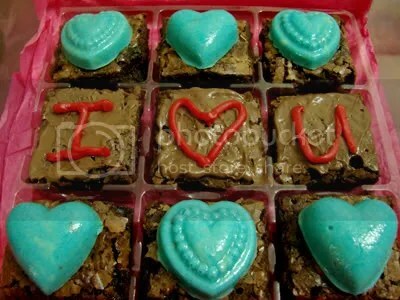 thank you thank you for this wonderful 3D brownie recipe. hurrah!! oops.. so sorry.. just saw the the recipe again… so sorry… but can u remember how many squares it would make? taking each square to be the size of the plastic tray? i wanna make this for a party but i dunno if 1 batch will be enough~! hello steph, hmmm i used a 9 inch shallow square tin… i think if you judge by those small squares…. around 25? thanks maya~! appreciate it.. will try them out really soon!! cnt wait!!! made this yesterday…another wonderful recipe by you…thanks! !